A review of 1954 out-of-hospital tracheal intubation (ETI) attempts by EMS crews revealed 444 (22.7%) patients experienced one or more ETI errors, including tube misplacement or dislodgement in 61 (3%), multiple ETI attempts in 62 (3%) and failed ETI in 359 (15%). Pneumonitis was associated with failed ETI (n=20, 19%; univariable OR 2.54; 95% CI 1.24-5.25). The authors conclude that out-of-hospital ETI errors are not associated with mortality, but failed out-of-hospital ETI increases the odds of pneumonitis. A nurse-based pre-hospital care system in Holland describes its experience with pre-hospital CPAP for acute cardiogenic pulmonary oedema. It appears that the simple Boussignac apparatus is straightforward to apply in the ambulance environment. Arguments about lack of outcome studies aside, if it’s necessary to undertake an interhospital transfer of a patient established on CPAP then this might be a relatively straightforward means of doing so. A prospective observational study of paediatric patients requiring pre-hospital intubation attended by a helicopter medical team (HMT) included 95 children with a GCS of 3-4. Fifty-four received bag-mask support by EMS paramedics until the HMT arrived and intubated them (survival 63%), and 41 were intubated by EMS paramedics. Of these, ‘correction of tube/ventilation’ was required in 37% and the survival was 5%. 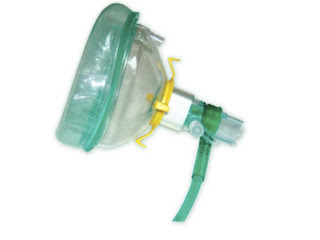 The authors conclude that bag-mask support should be the technique of choice by EMS paramedics, as the rate of complications of tracheal intubation in this patient group is unacceptably high. Hard to comment as I only have access to the abstract but one wonders if the EMS-intubation group were sicker patients requiring more aggressive early control of airway and breathing.